"Telstra Dome management with the support of Football Federation Australia and Melbourne Victory have agreed to implement some seating and entrance adjustments at future Hyundai A-League matches due to recent issues relating to crowd behaviour." 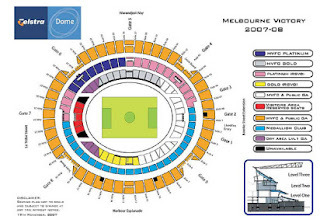 Basically changes involve moving the visiting supporters area to behind the goals with these supporters who purchase tickets from the ‘visiting team’ allocation being required to enter and exit Telstra Dome through Gate 7. This Gate will not be available to other ticket holders. There will be also areas where there no seating adjacent to the visiting supporters and entrance tunnels. This is a massive overreaction from the Telstra Dome authorities after incidents after the last Victory home game against SydneyFC and its associated media coverage. I am not disputing the media facts but more the method of reporting any incidents that occur at A-League matches. Any incident appears to get front and back page coverage in the AFL backed newspapers. All I am asking for is a little parity in the coverage of such incidents. I am aware of two all-in-brawls involving 20-30 people and police in the MCC section of the MCG at two AFL games last season and these barely rated a mention in the local newspapers with only the second brawl receiving a few paragraphs of newspaper column. It seems that the Telstra Dome authorities have decided that they can't handle a small amount of bad publicity and are now dictating terms to the Melbourne Victory administration, who unfortunately are not making their own stand against the Telstra Dome and unruly fans. The people at the Telstra Dome need to be reminded that without the Melbourne Victory their stadium would sit empty for most of summer. Personally, I can't wait until the new stadium is open and we don't have to kow tow to the wishes of the Telstra Dome authorities. The former system where the away supporters were seated for all regular home and away matches between aisles 41 and 44 has worked (which is basically opposite the corner flag at the north-western side of the ground) for all of last season and for most of the home games for this season. This position also puts them in close proximity to their team's bench. This was seen as the ideal location for away supporters as for the most part most clubs do not have a large travelling contingent. Although it has been brought to my attention that it was also located in a dry area, which is a bit harsh on the away supporters. I could understand setting aside a section behind the northern goals for away supporters if the teams were geographically closer and large amounts of travelling fans were attending games. For example in Argentina they set aside 4,000 (much larger stadiums) seats for away fans basically because large amounts of travelling fans attend games and teams are often geographically close, particularly in Buenos Aires itself. However this is not the case in the A-League, where only SydneyFC and Adelaide United supporters providing substantial away support. Therefore for tonight's match against Wellington the northern terrace is basically going to be empty as it my understanding that not many Phoenix will be attending this game as they are more likely to attend the January fixture with more numbers. This will have a significant impact on the atmosphere at the game, with all the noise coming from the one end and not both as it currently stands. The move also displaces a key Victory supporter group at that end of the stadium and forces them to "stand" at the other end. What is distinctive about the support for the Victory is that there is a number of supporter groups who choose to support the team in different ways. It is my understanding, and I could be wrong that the "northern" end takes its inspiration from the more European style of support whereas the supporters at the "southern"* end tend to take their inspiration from a more English/Scottish style of support. These two distinct types of supporters blend to provide an atmosphere that is unlike any other in the Australian game. Their location also allows for some usually good natured banter between them and the away supporters. Its time to pull your head in Telstra Dome and its about time the Melbourne Victory administration to stood up for its supporters, which in my very humble and biased opinion are the best in the A-League. It will be interesting to see how the supporter groups react to these changes and what form of protest they take against this unjust decision. * - I put these terms in brackets because the northern end is actually at the southern end of the Telstra Dome and vice versa for the northern end. These terms refer to previous locations at our former home, Olympic Park. It is also the main reason why the "we are northern over here" tends not to work as well because the fans on the wings tend to argue amongst themselves about which side of the ground they are actually on. I know, I sit amongst these people as part of the Prawn Sandwich Crew. I totally agree in that this is a massive overreaction. Not only has it killed the atmosphere of the game it has taken away the home advantage of being able to attack either goal with a massive home following behind. It must have been a real strange experience for the players attacking the 'south end' occupied by 50 or so visiting supporters. The away fans should be put down the sidelines and the spaces behind the goals given back to the fans, especially based on the fact that no standing is permitted in any other areas other than behind the goals on level 1.